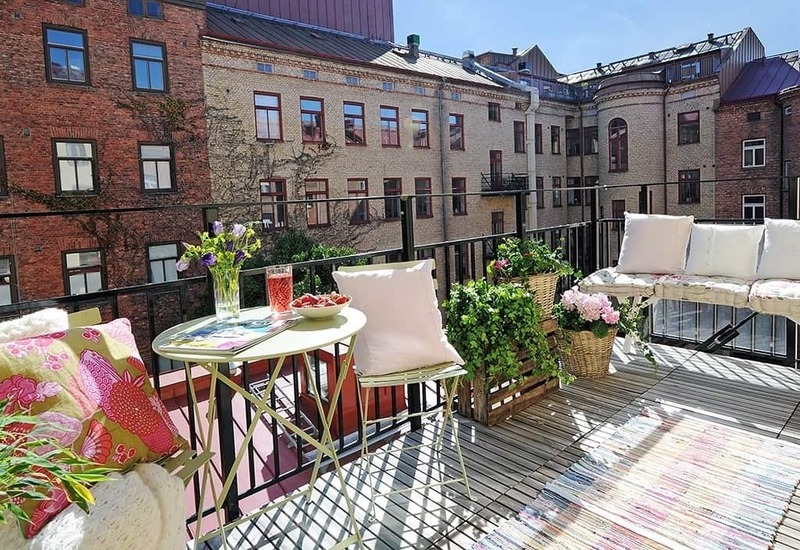 Now that spring has sprung, its time to start thinking about ways to infuse spring style into your outdoor balcony, through updating and refreshing to give it a whole new look! 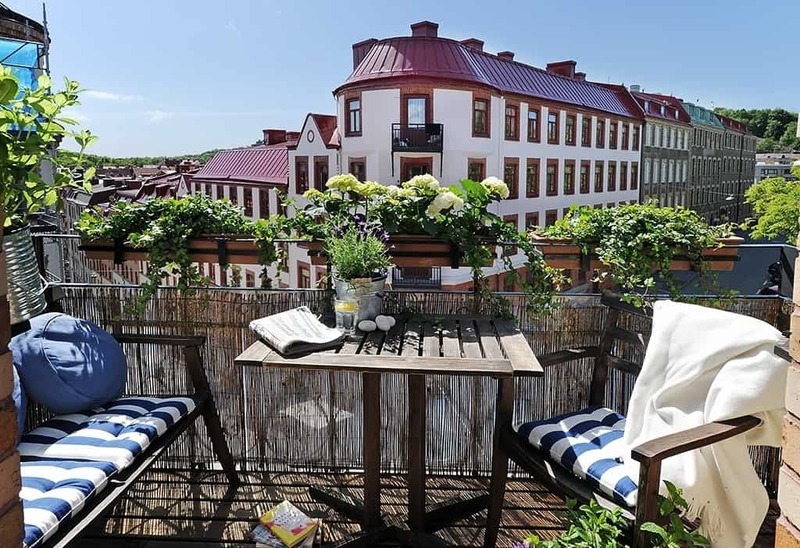 Just like your interior spaces, your balcony can benefit from a seasonal spruce up by re-arranging your furnishings and adding some new accessories. 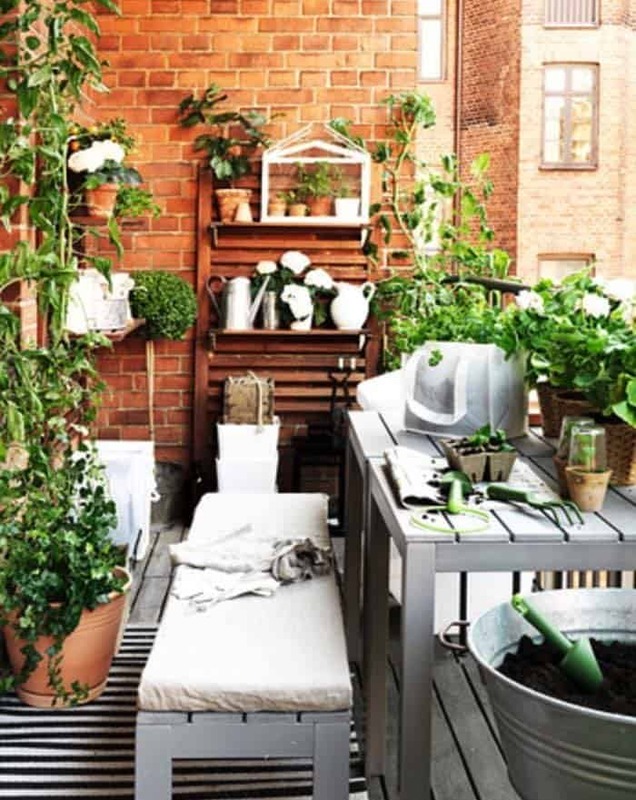 If you are looking for just a quick fix, you can add a planter, some small pots, a lantern or other outdoor decor items to you space. 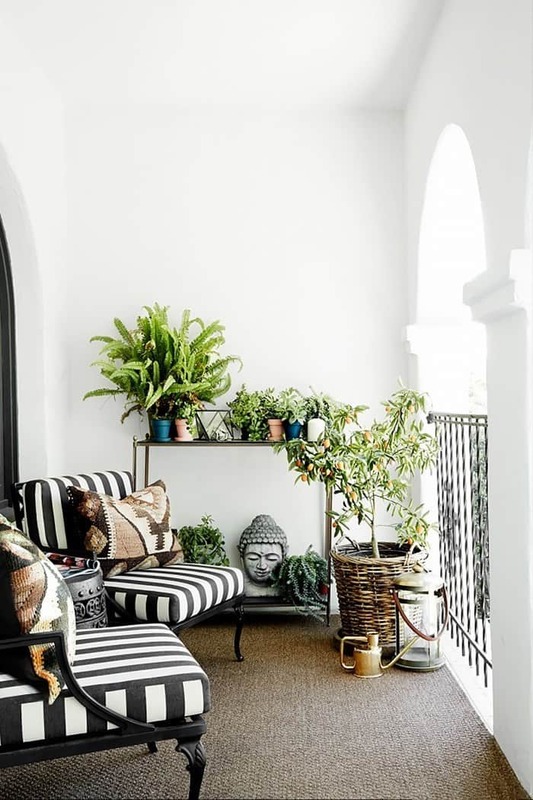 You may want to consider an area rug and since it is springtime, you may want to infuse some bright pops of color with stripes or graphic prints. 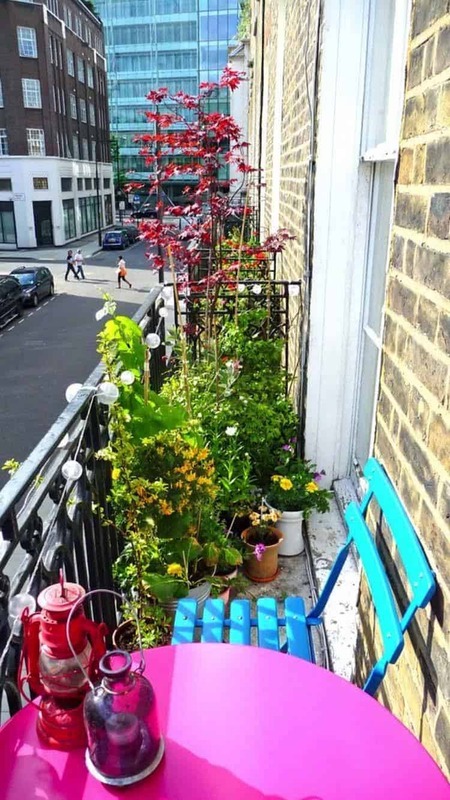 A watering can left on a side table or on the ground can be multi-purpose, there when you need it to water your plants and used as a cute decorative accent. 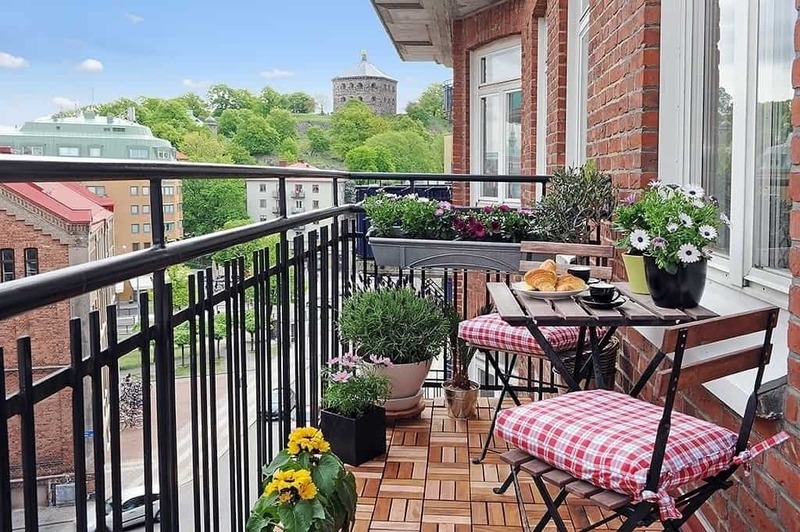 Other great amenities to add to your springtime balcony, a small barbecue, a tabletop fireplace—check Target for a nice selection—an oil lamp, or even a fire bowl (if you are in an apartment you may want to check your lease or first). 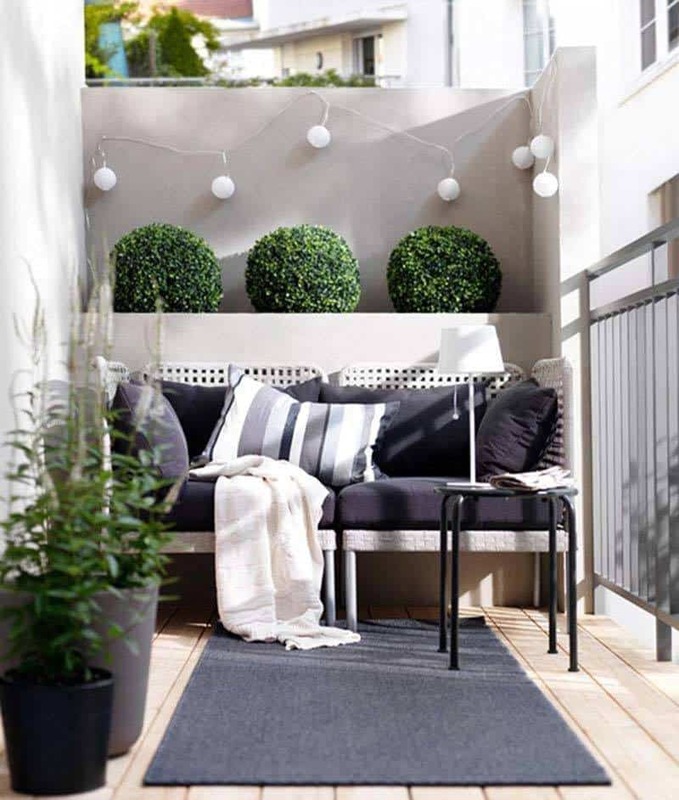 A big change would encompass adding some brand new outdoor furniture pieces to your space or hang some string lights to create a serene oasis that will look great at night! 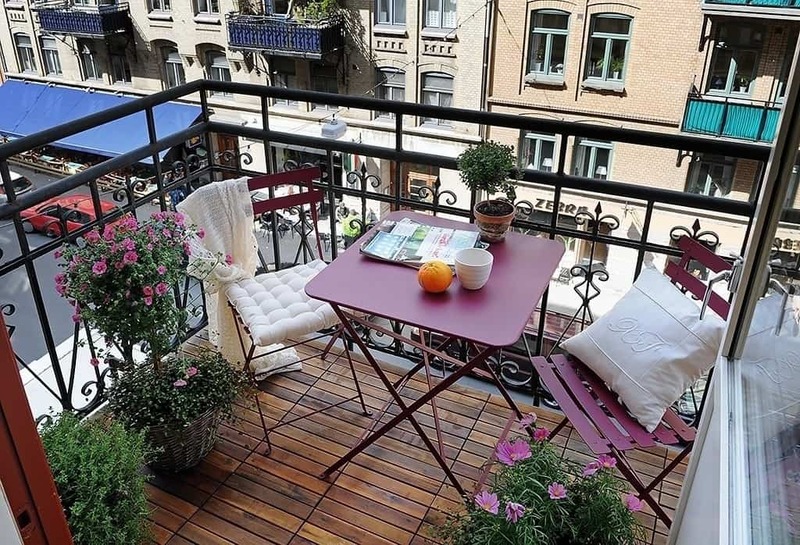 If your balcony is not spring ready, than have a look below for some beautiful and inspiring ideas that we have gathered together for you that we hope you will find useful. 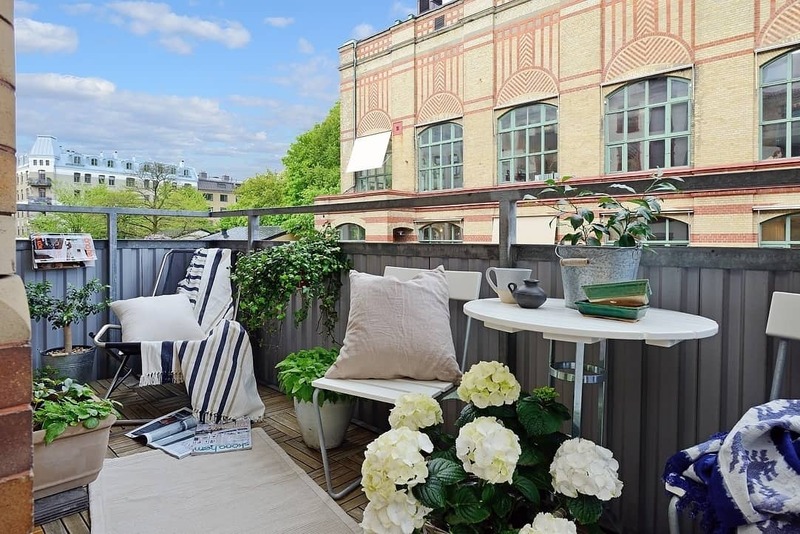 If you want more outdoor inspiration on 1 Kindesign, then have a look here. Enjoy! 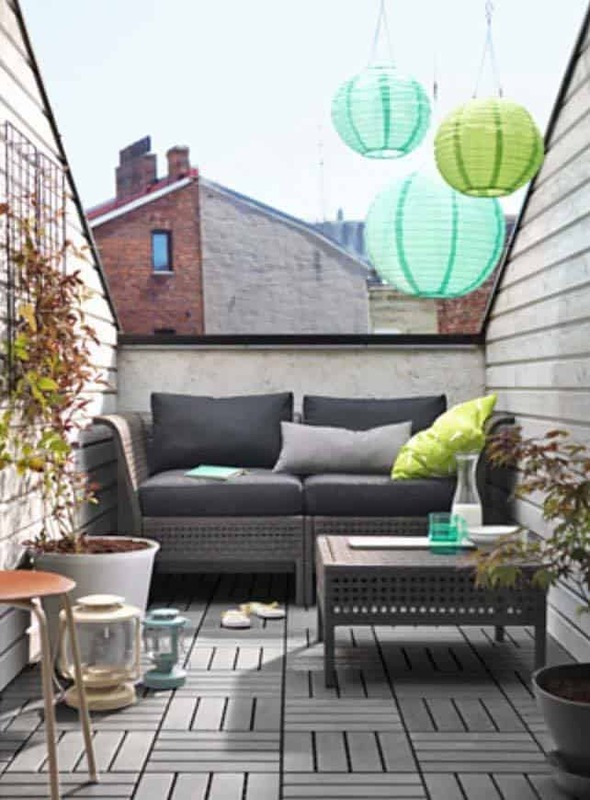 Ikea inspired decor, yes you can find all of this items from there… but you can also find the paper lanterns at World Market! 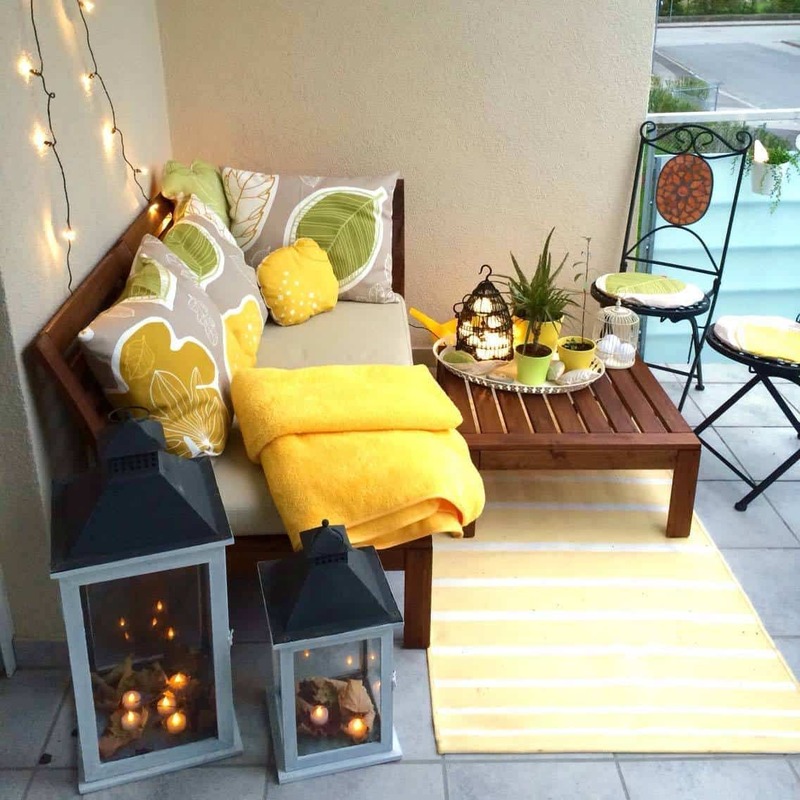 Colorful pillows, lanterns with tea lights and string lights help to the set mood on this patio. 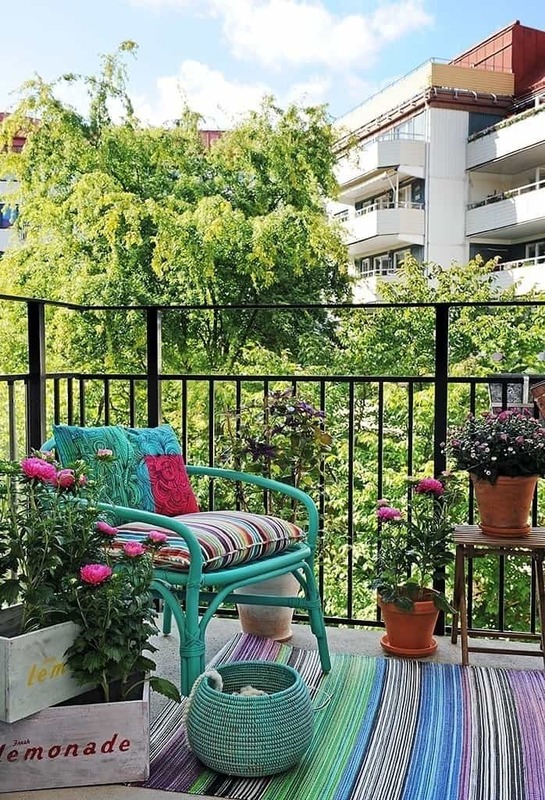 A vibrant area rug also helps to add some spring to where you step! 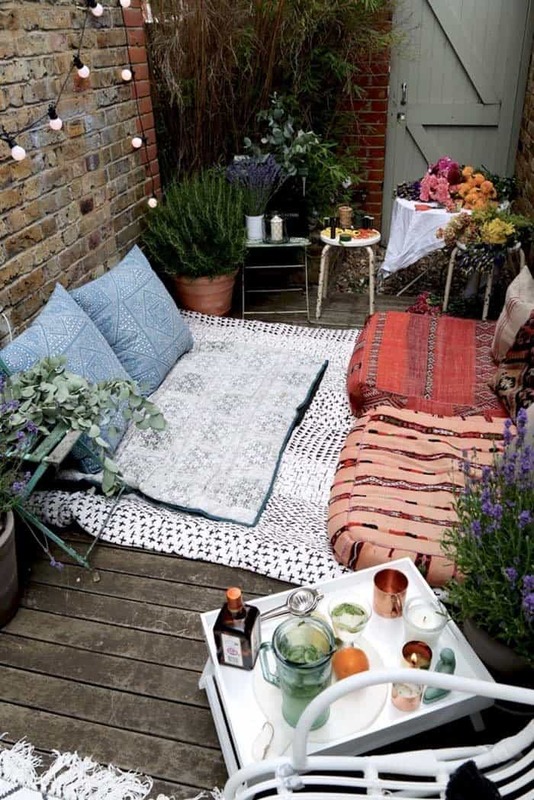 Create a boho chic patio by adding pillows and blankets on the ground… spring is in the air with flowers and plants abound. 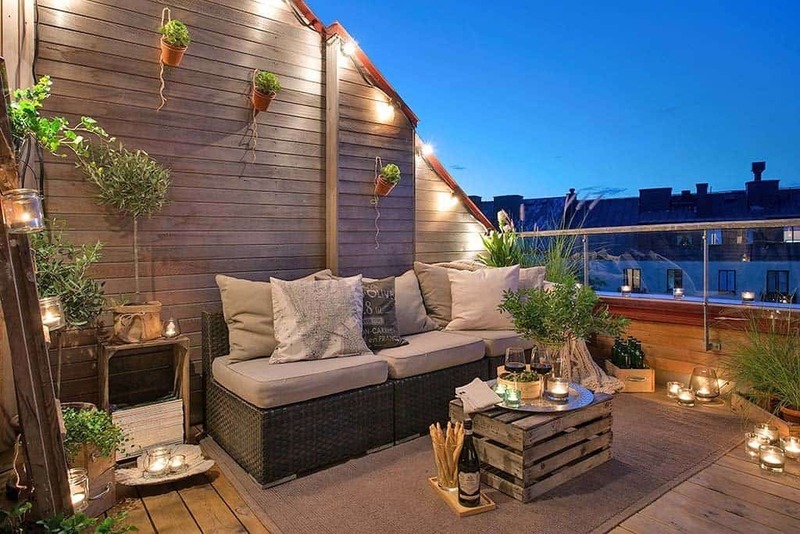 The finishing touch to set the ambiance is some string lights, which look awesome set across that brick wall. 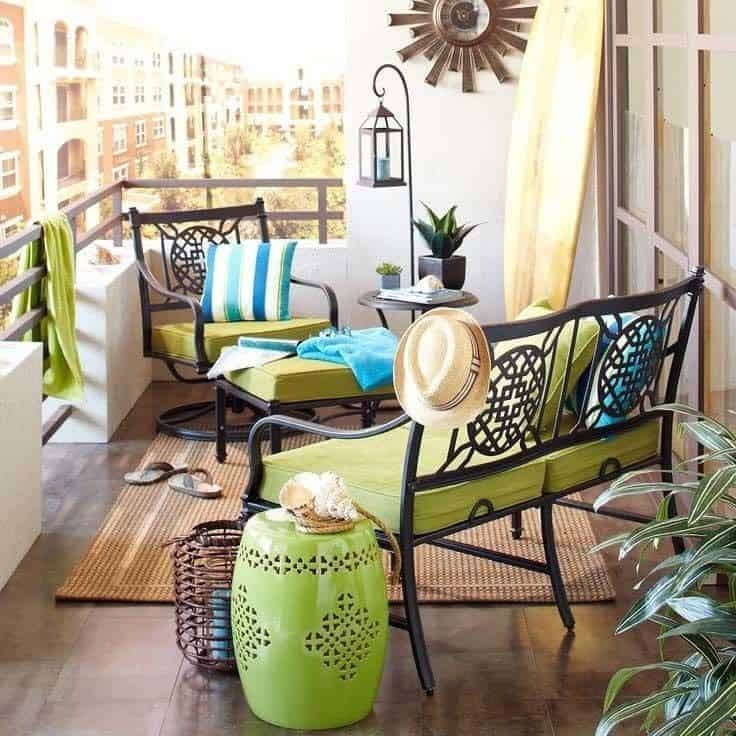 Adding fresh greenery to your patio not only breathes life into the space, but adds color and lets you know that spring is in the air. 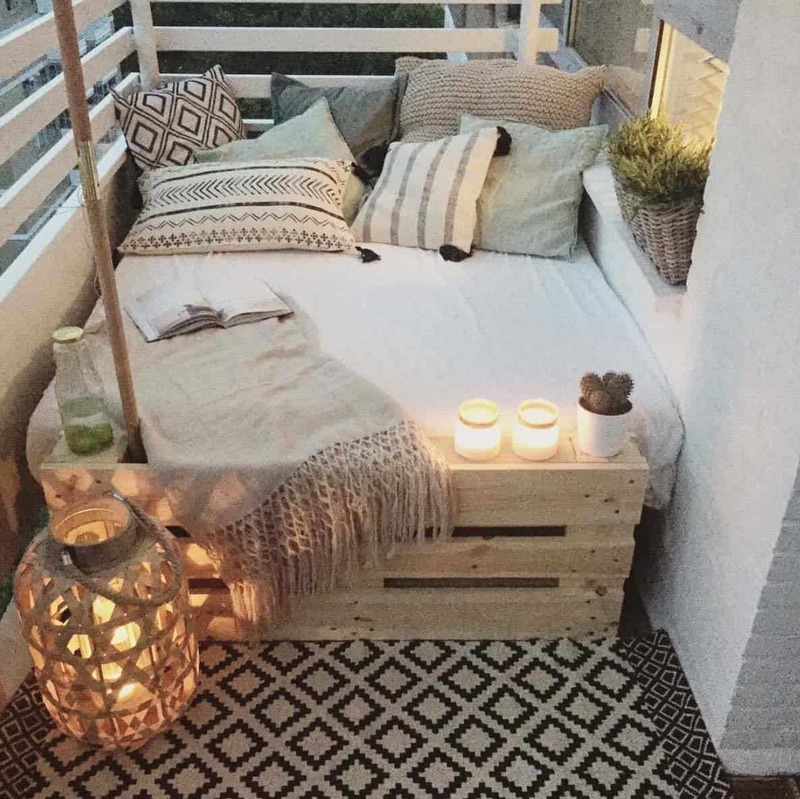 Create a daybed made out of pallets to lounge on your patio and enjoy the fresh spring air… don’t forget to add a lantern for mood lighting and some candles! 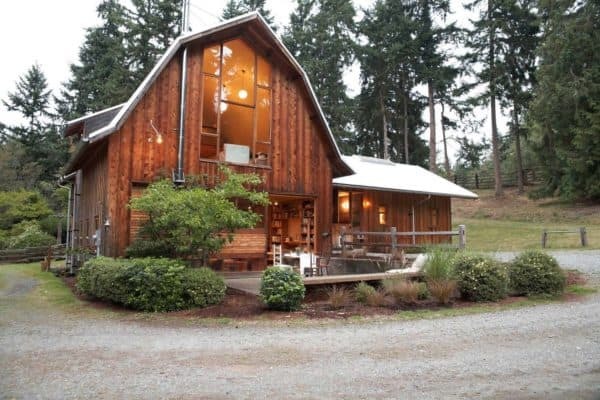 String lights are always in season, adding some navy colored fabrics into your decor adds a hint of coastal charm. 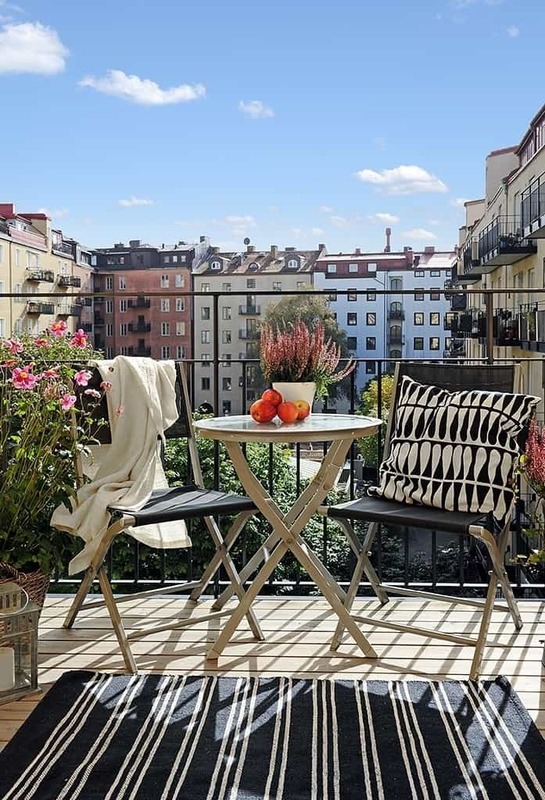 Don’t forget a throw, as spring evenings can be cool. 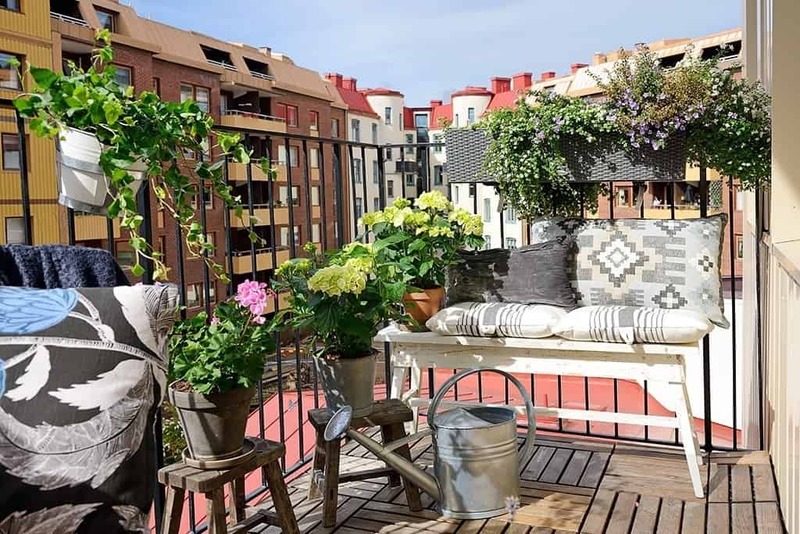 Hang potted flowers off your balcony railing with a rail planter (you can find them at Crate and Barrel) to add vibrancy and nature onto your balcony space. 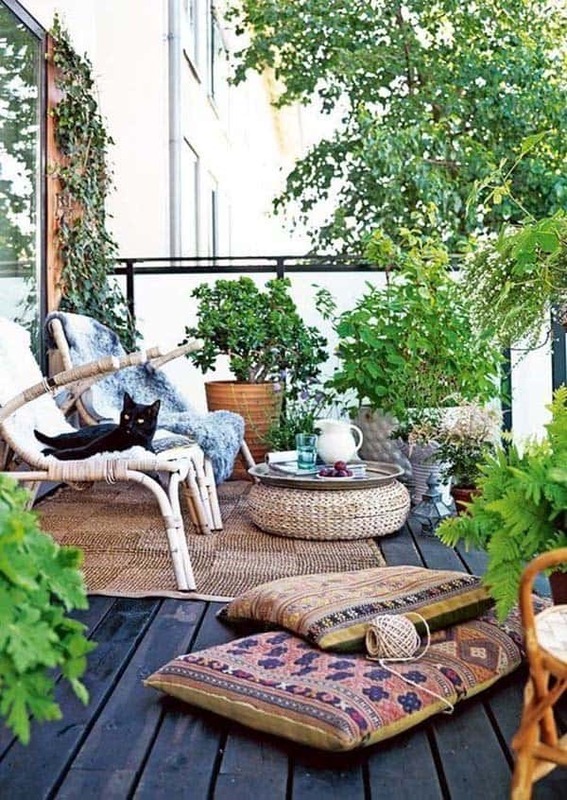 Another great Boho-inspired balcony, make sure you have a comfy spot for your kitty to enjoy the spring sunshine! 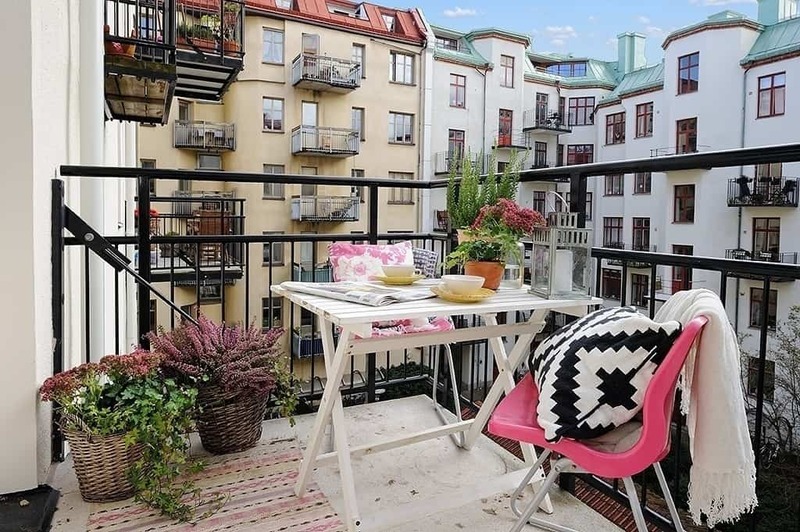 Blue balcony furniture adds a nice pop of color, same with the graphical flower pillow and pink throw. 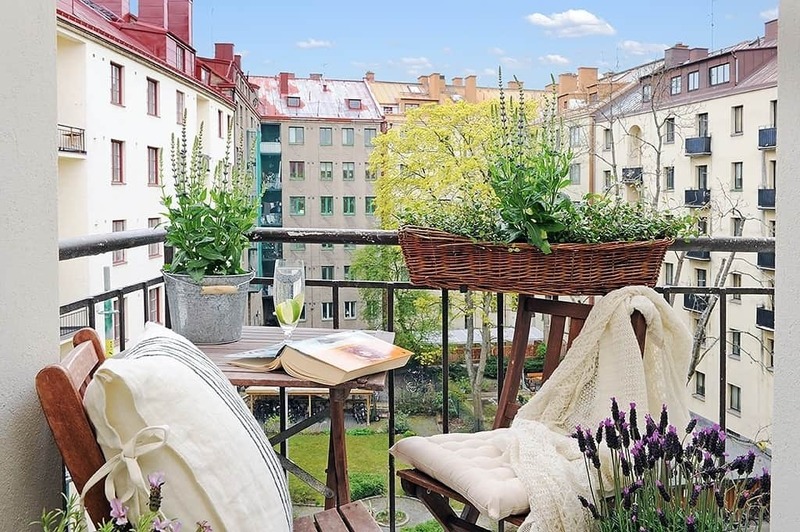 Adding a ladder is a great way to store magazines to read when you are lounging and enjoying the fresh spring air. A colorful area rug adds texture and playfulness to the space, and feels great underfoot! 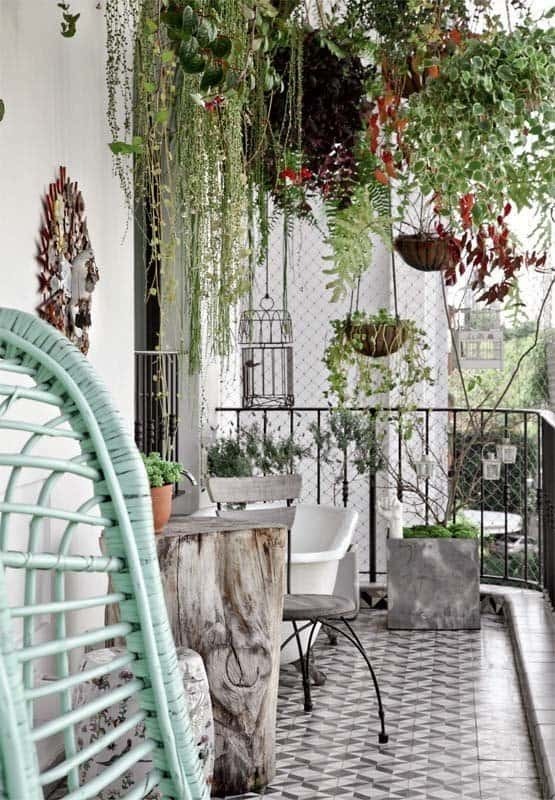 Try different types of pots for visual interest, from rectangular to cylindrical. 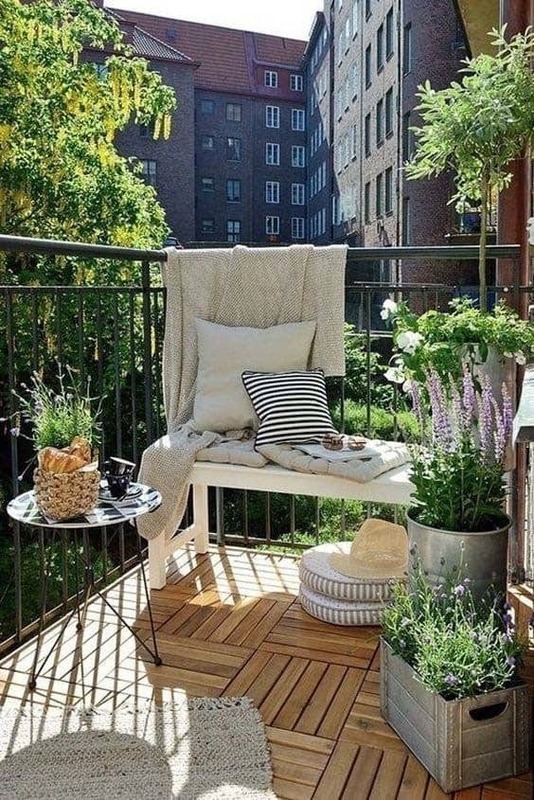 Lavender is great for pots, adds a nice scent and color to your space. 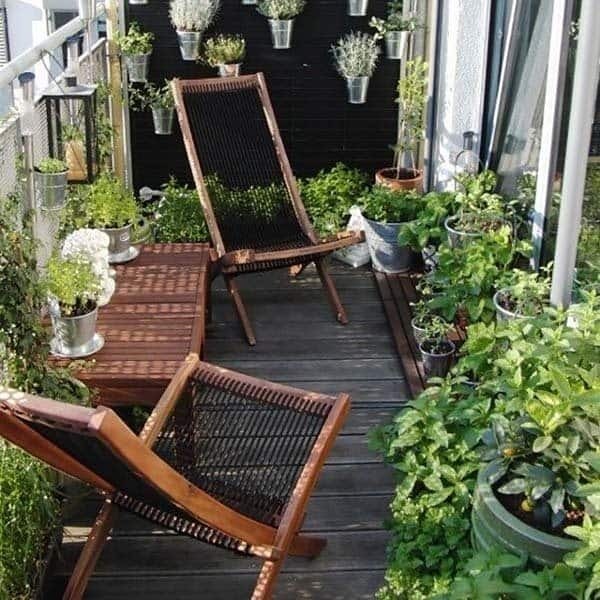 You could also try growing a fresh herb garden in some pots. 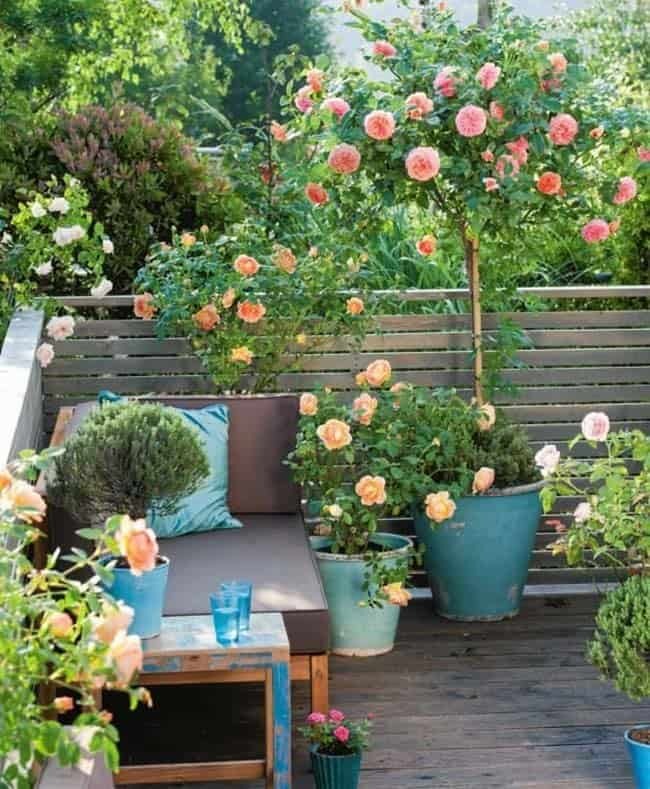 Roses are always a fresh bloom for the patio, colorful and fragrant and always in trend. 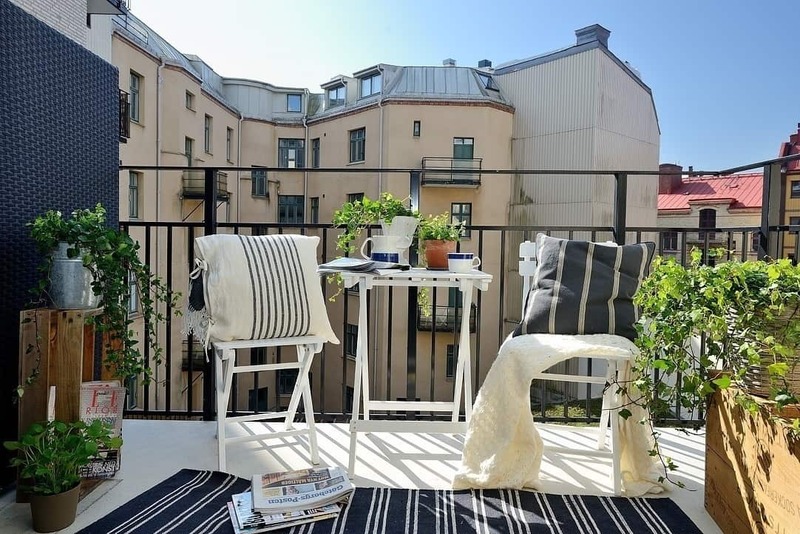 If you are limited on space, a bench will suffice for a cozy space to sit and enjoy some fresh air. 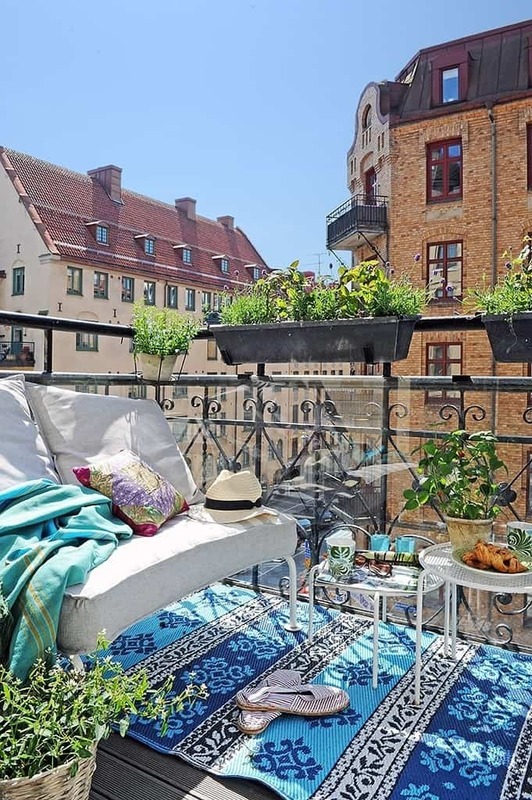 A closed-in balcony with plenty of windows will bring sunshine in to soak the plants with natural light. 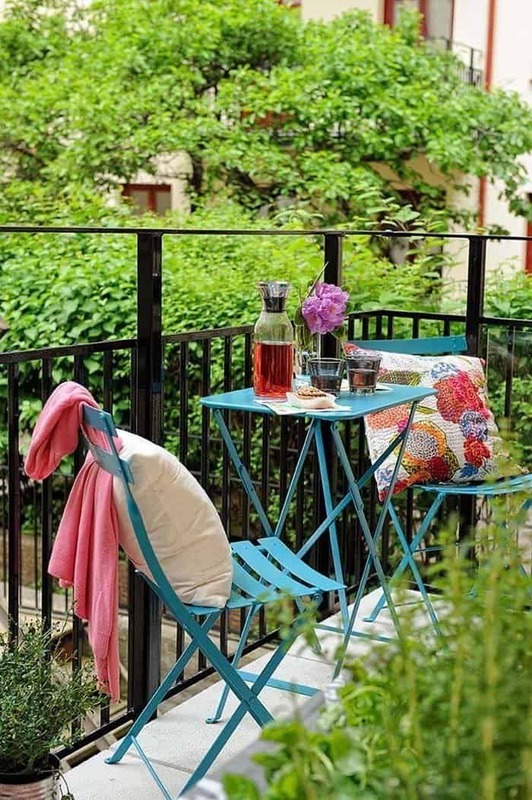 Pink is a great color to infuse some spring into your outdoor scheme. 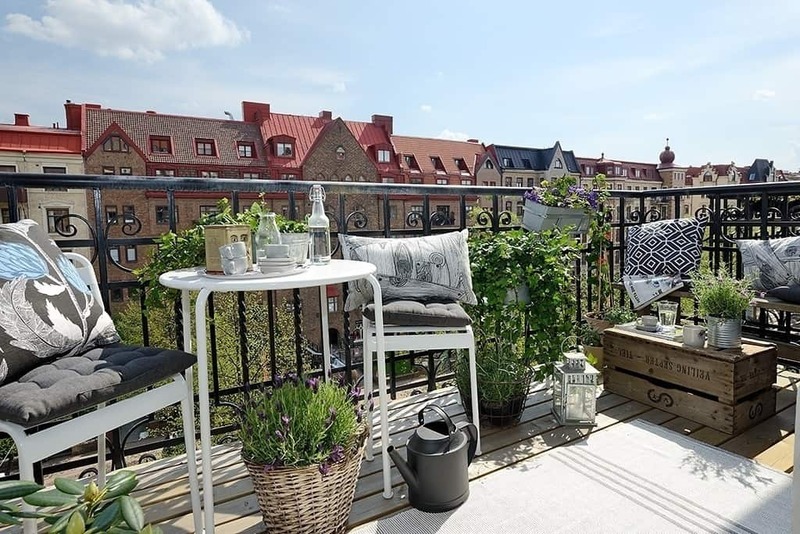 Recycled box crates are perfect for decoration, used as a small table or they can be used to pot plants. 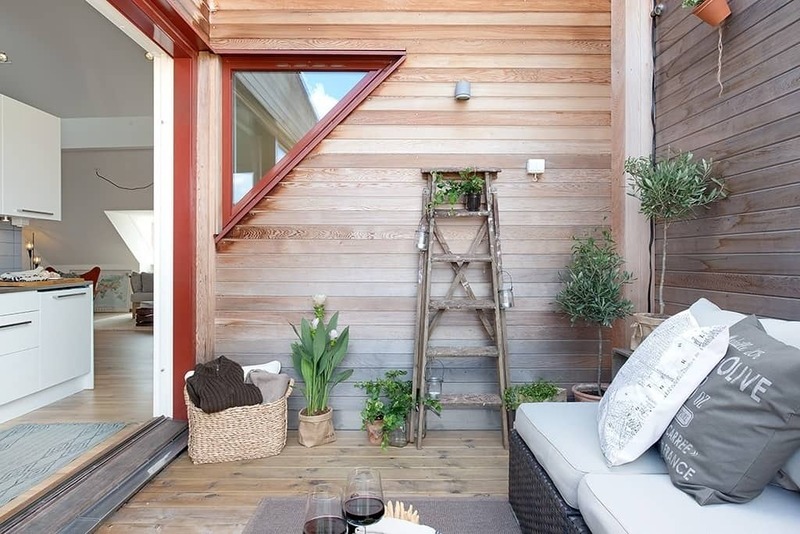 A watering can makes for great decor and easy accessibility when plants need a drink. 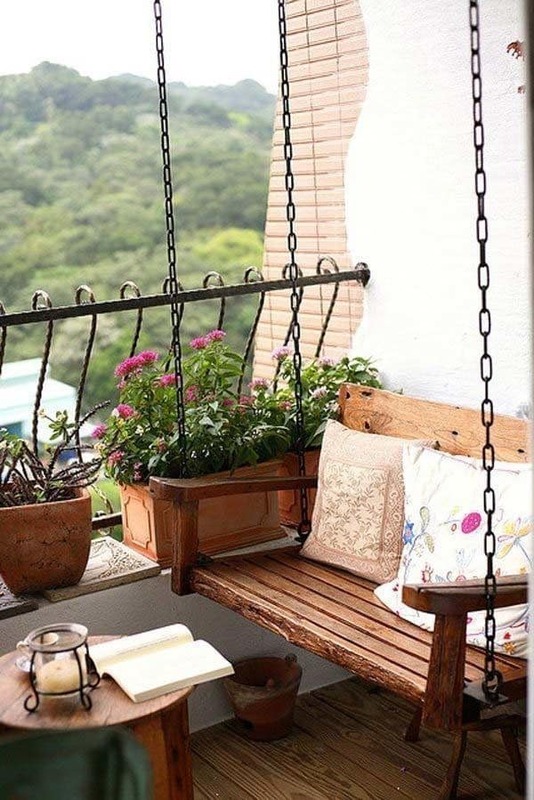 Colorful flowers in pots and in rail hanging pots makes a cozy little oasis. 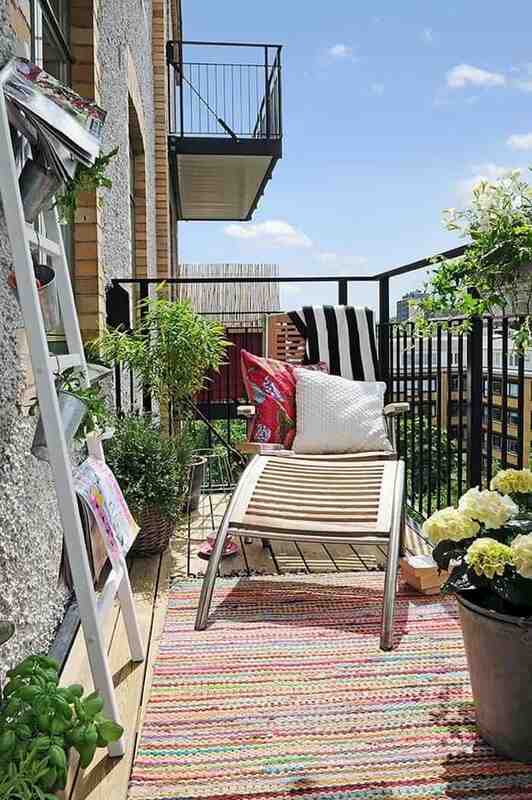 A ladder gets re-purposed to hang small lanterns and decorate with plants. 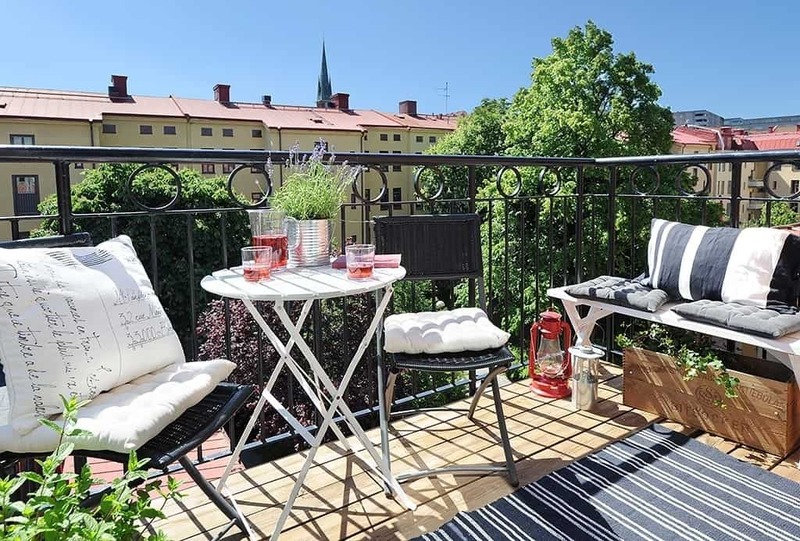 Add some romance to your balcony with candles and string lights. 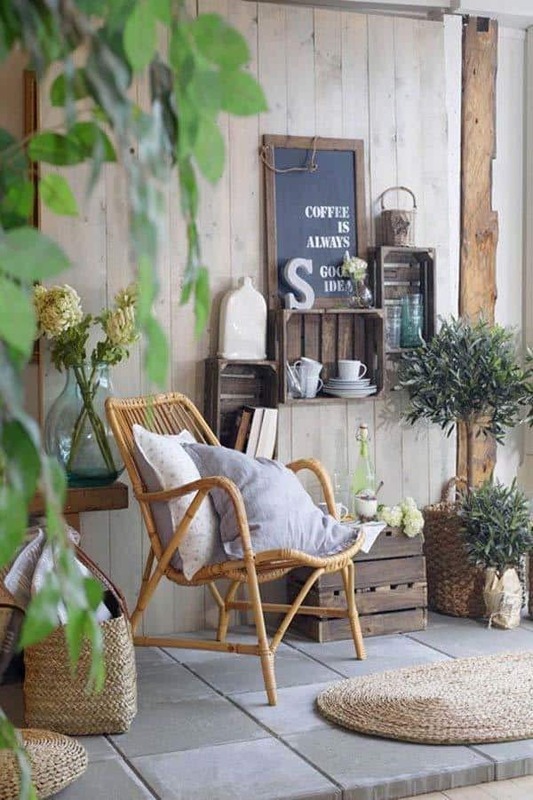 A box crate gets re-purposed into a coffee table, while pots cleverly hang off the wall. 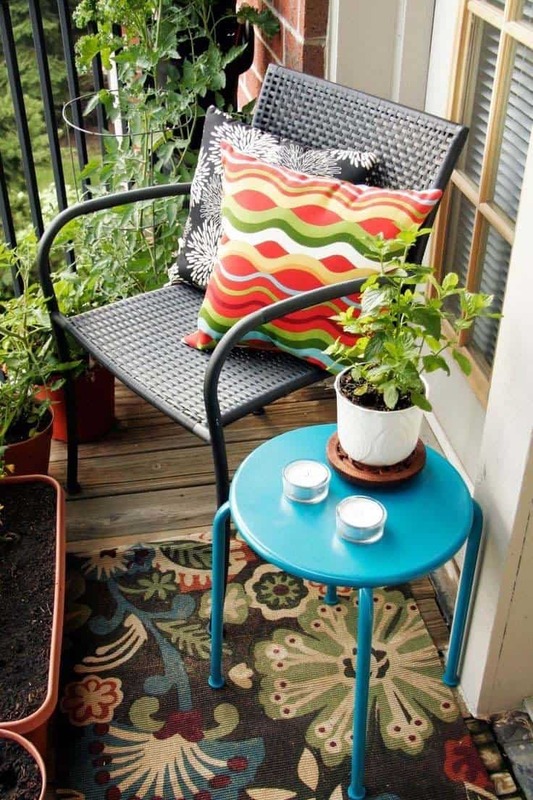 Some great DIY’ing on this patio, with a shower curtain rod (tension rod) used to hang pillows for added back comfort. 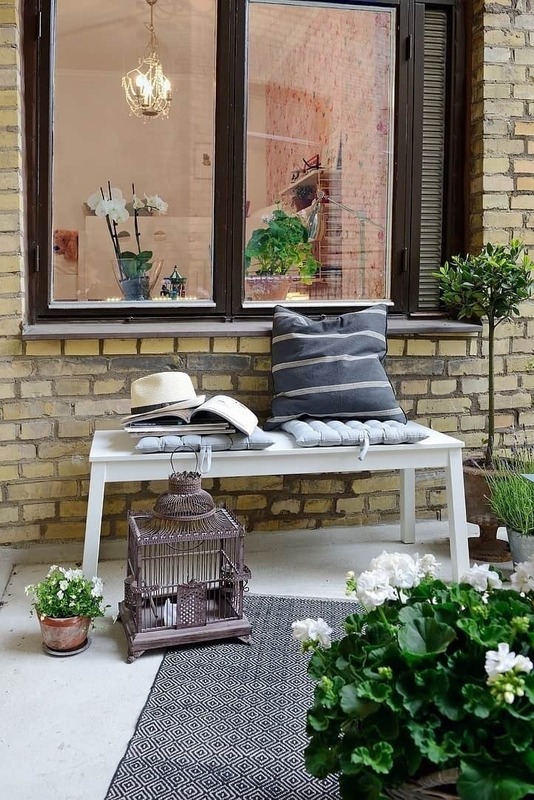 The bench can have a fold up lid to store pillows when not in use to keep them clean from the elements. 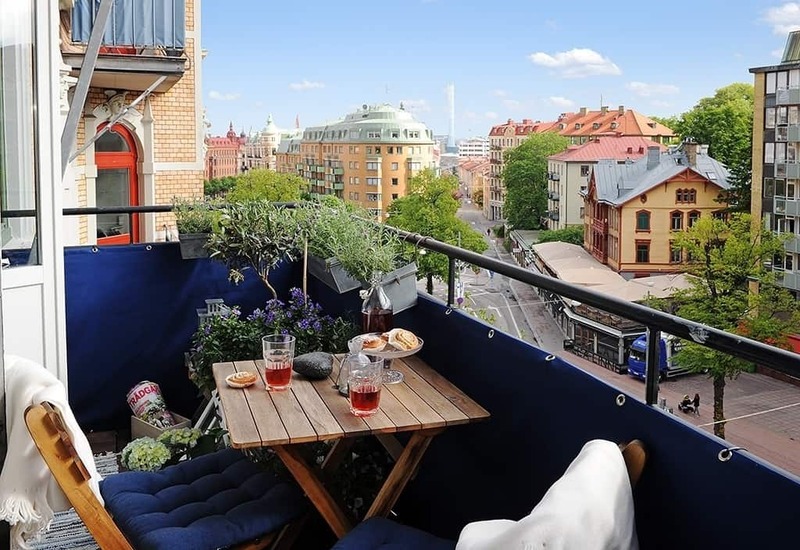 Now here is a novel idea, suspending a bench chair from the ceiling, you usually see these on a front porch not on a balcony… but why not, love it! 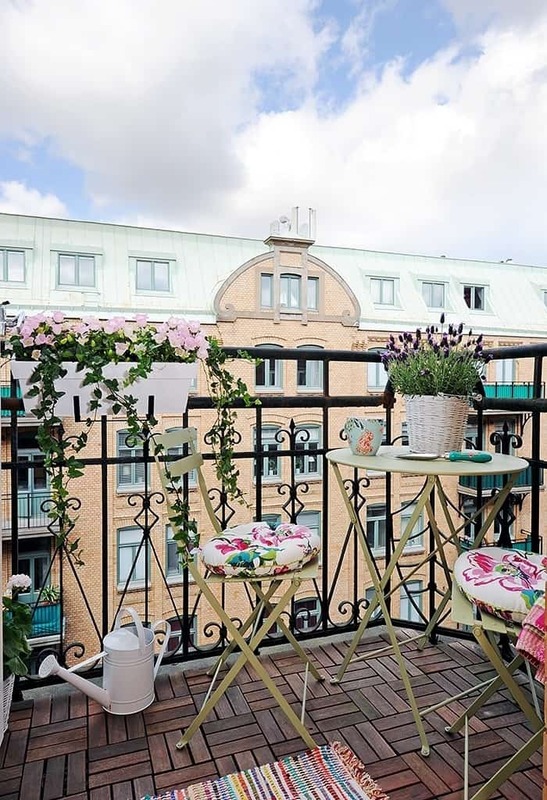 A balcony with potted flowers everywhere, that will really make it feel like spring! 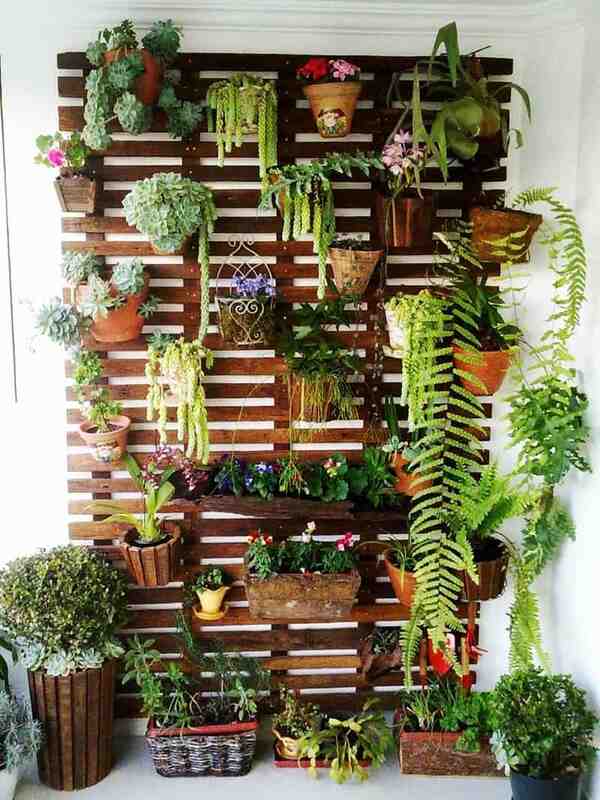 Vertical gardens are fantastic, don’t forget to consider some herbs if you love to cook! 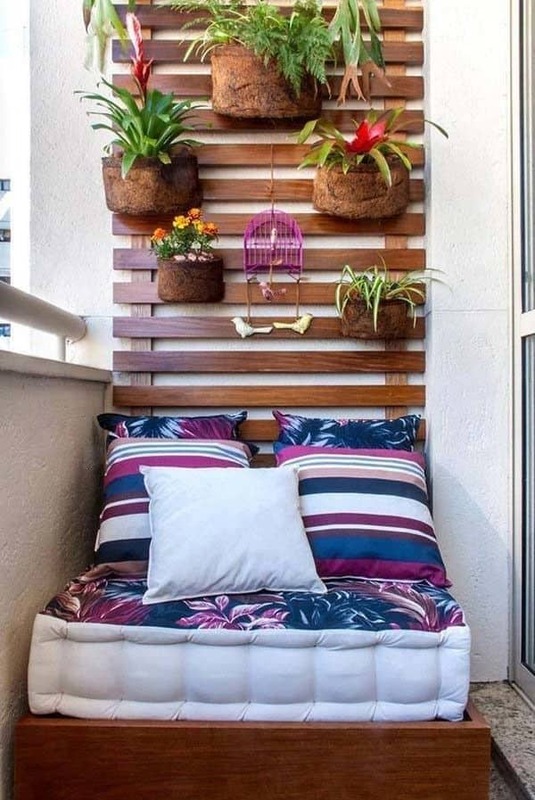 A wall of flowers and plants, this is a perfect idea if you lack space! 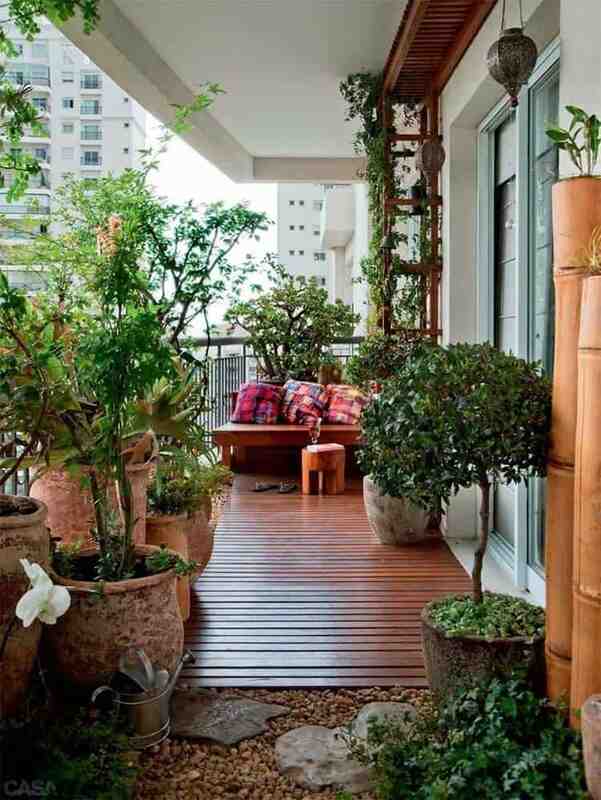 Ferns, succulents, ivy would be another great option. 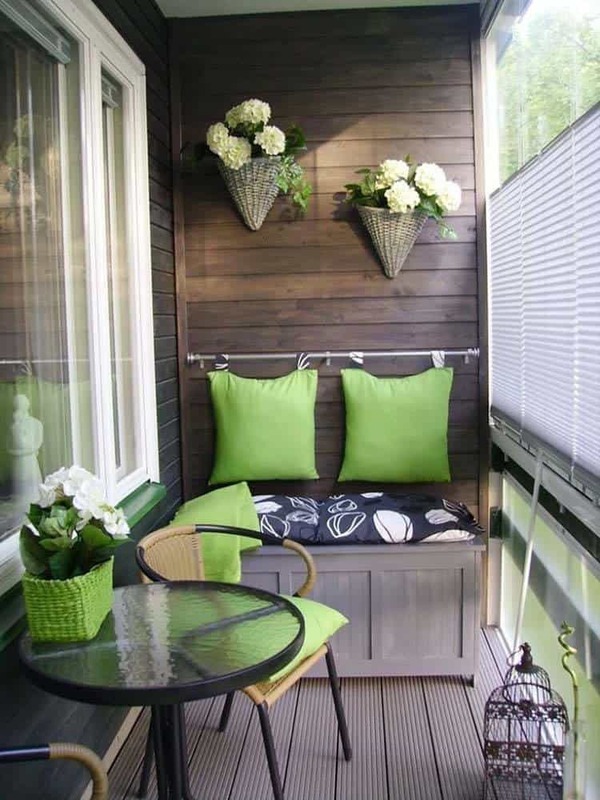 This is a great weekend DIY project. 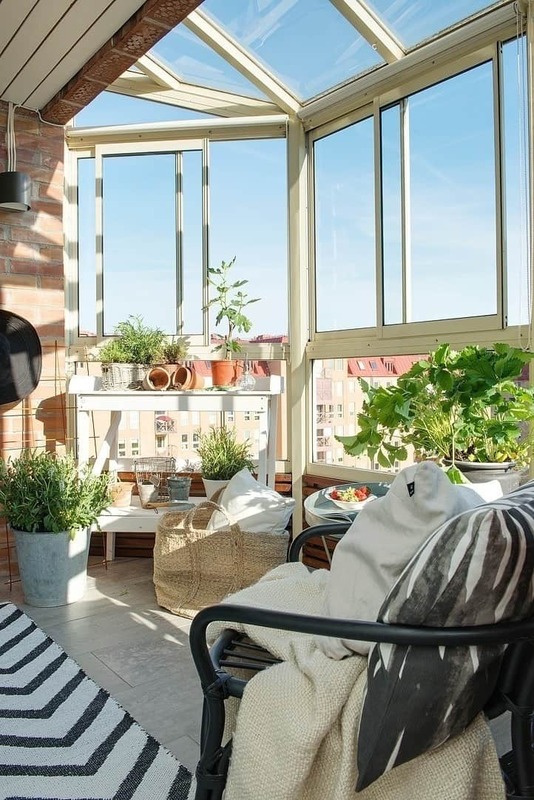 Another great example of space-saving by hanging plants from the ceiling. 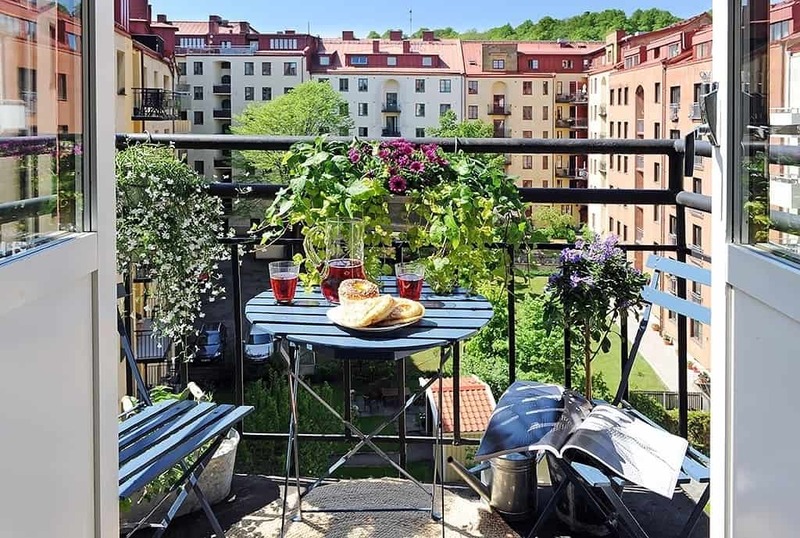 It looks like an urban jungle, love it! 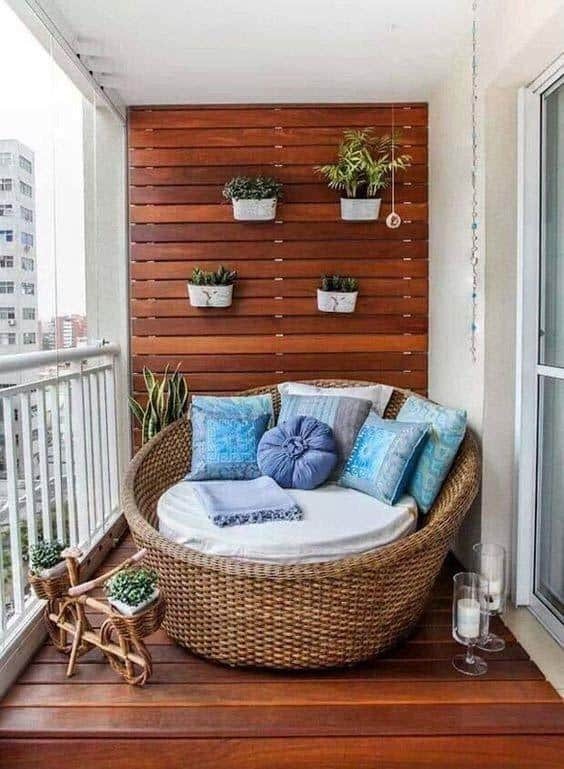 Now this would be cozy, a giant two-person chair to snuggle up in, with a vertical wall garden to save space. 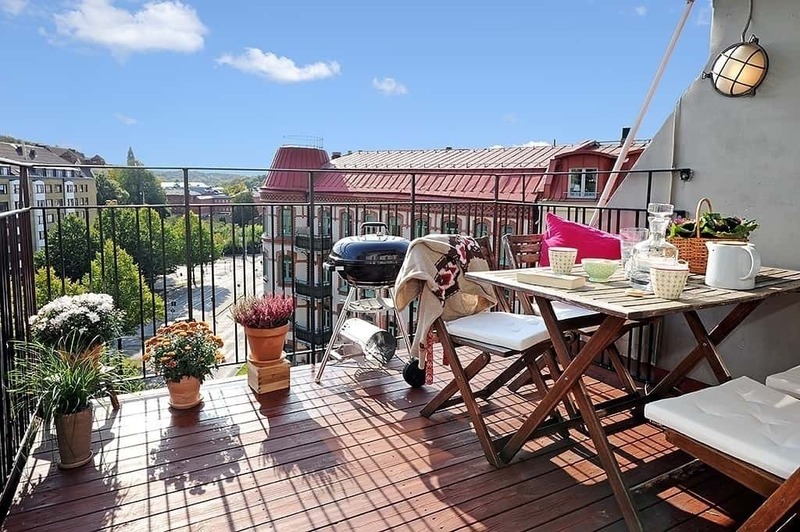 A couple of candles is a nice touch for some added ambiance. 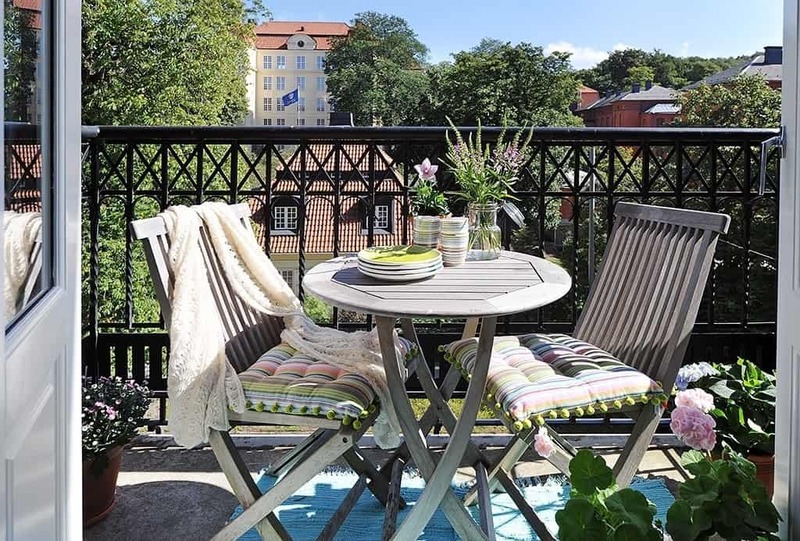 A very clean look, with iron chairs and ottoman, fresh green fabrics with some blue accents and a nice green stool, very nicely put together. 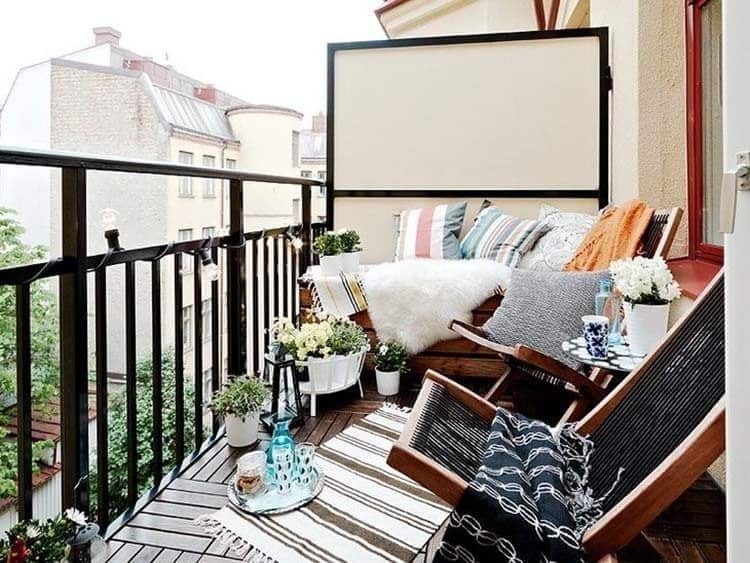 A small area rug finishes this space off nicely. 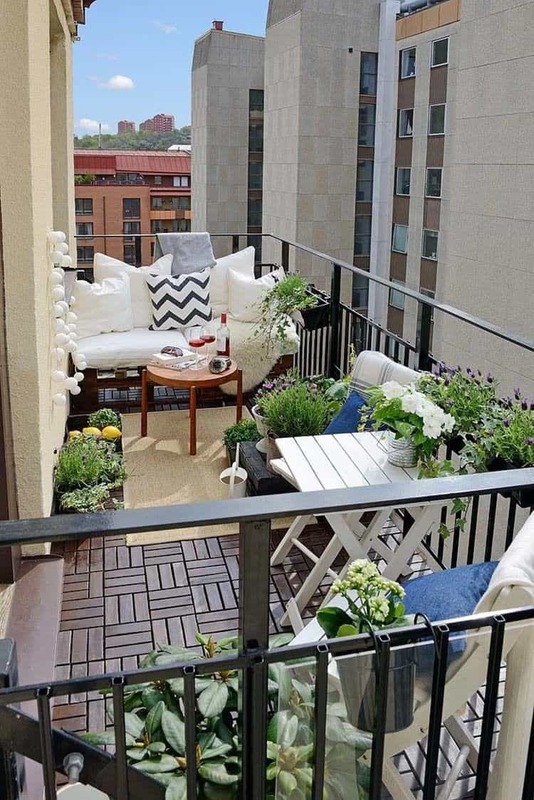 Another small balcony with space limits, but decorated to be very cozy with a DIY chaise and vertical garden wall. 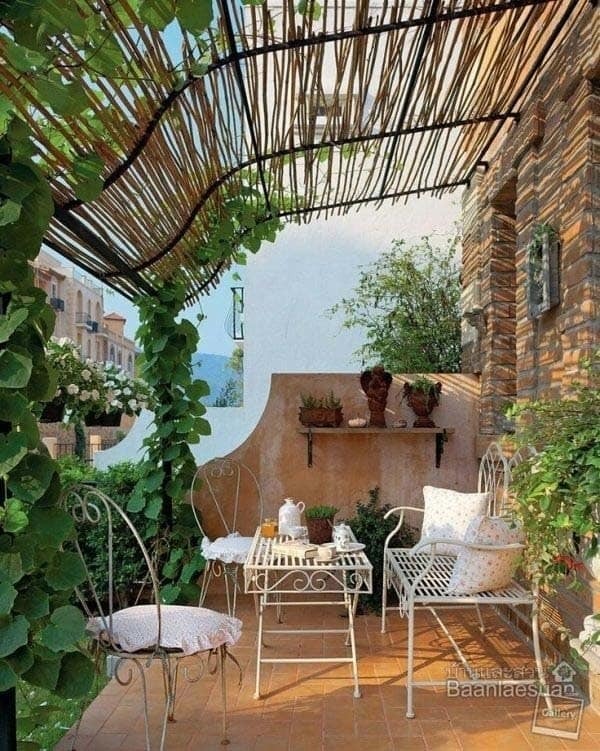 If the sun gets too hot on your patio, just add a trellis for some cover, looks like iron rods covered with bamboo sticks. Ivy climbs up the rods for added beauty and privacy. 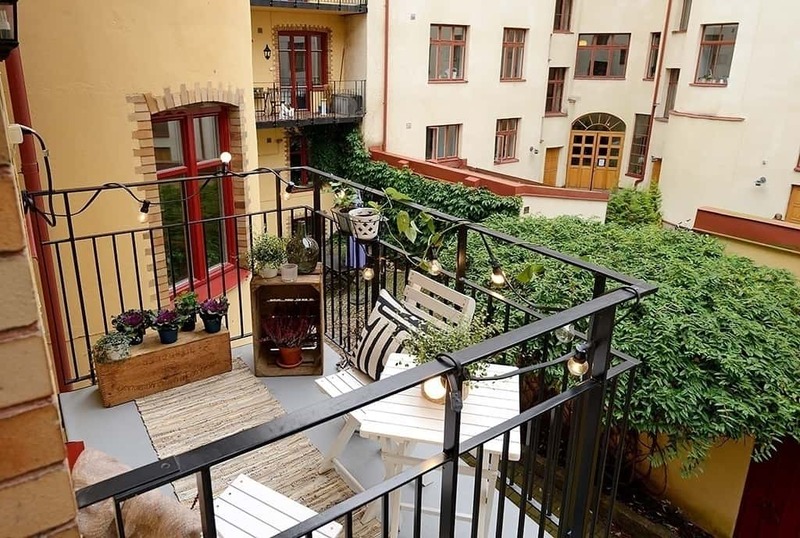 This balcony feels very Zen, with plenty of potted plants, some stepping stones in the gravel and a wood walkway. 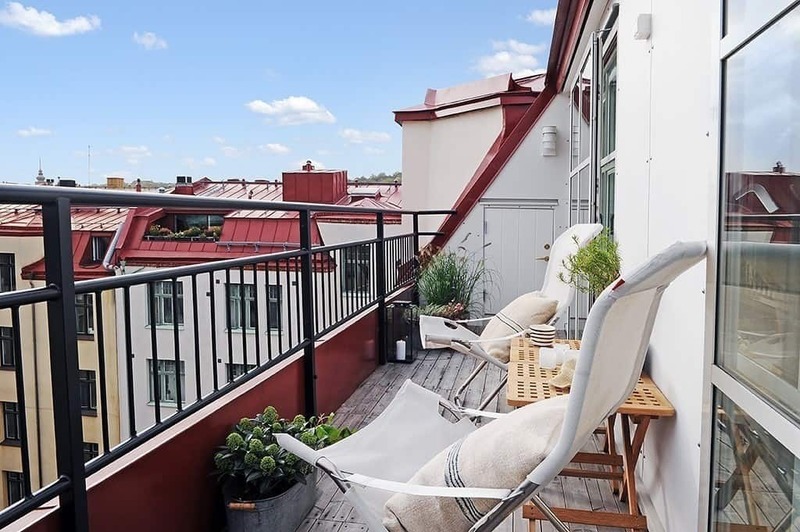 Looks like they also have a trellis with some vines growing up one side, an urban oasis! 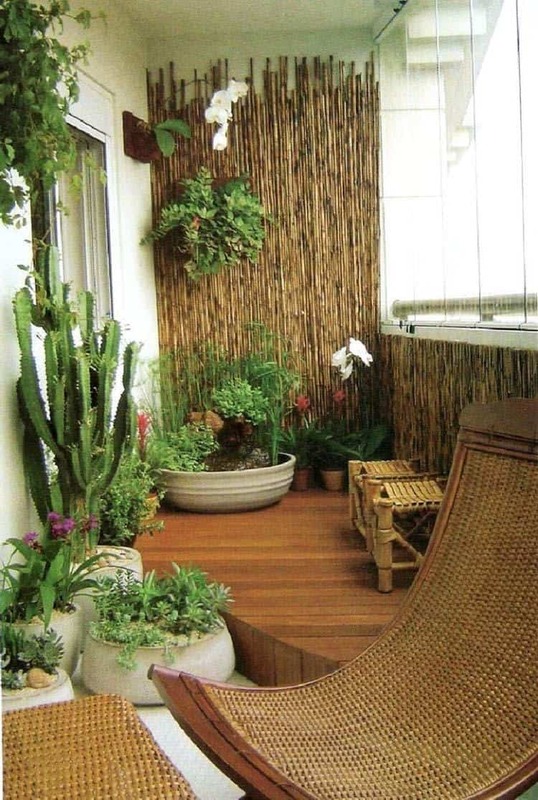 Bamboo sticks adds a nice outdoor feeling to the is patio, which features a mix of plants including some cactus. I was so happy coming to this blog. Simple amazing. 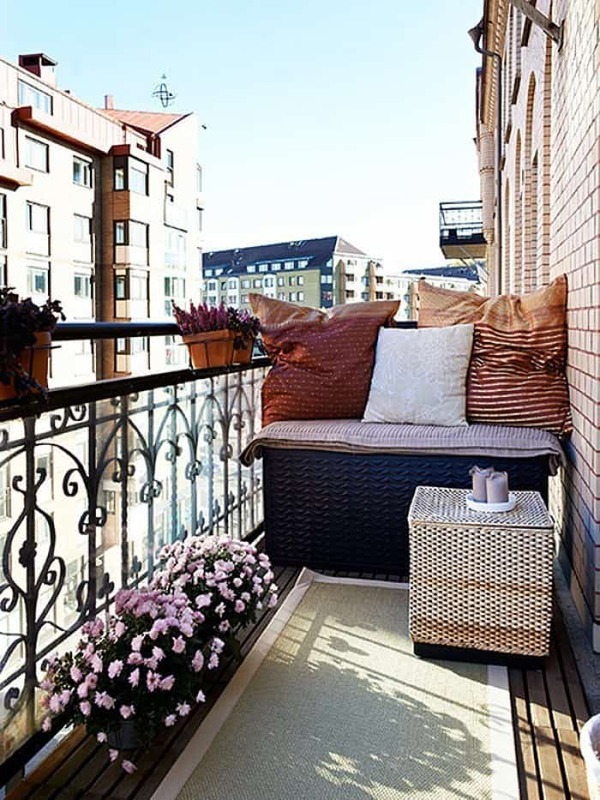 I loved your spring decor ideas for balcony. For sure can implement few. Thanks and keep sharing the same. ! !